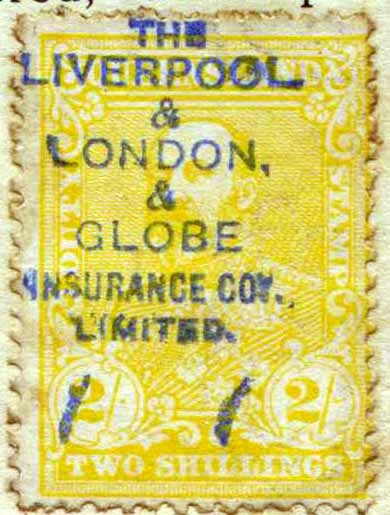 LLG used an earlier form of Security Overprint on their revenue stock prior to the perfin, it was by rubber stamp in blue. Earliest Known Date for this Security Overprint is 13/4/1912 with the latest date 15/6/1917. Revenue Use: KEDVII 1908 1/-, 2/-, 5/-, 10/-. Rarity Scale: KEDVII 1908 1/- R4, 2/- R4, 5/- R4, 10/- R4.